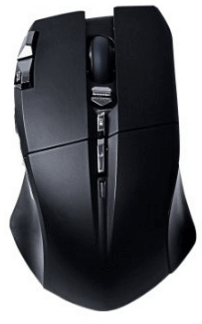 Today I am going to review the Gigabyte Aivia Uranium wireless gaming mouse. Now Gigabyte never really caught my attention with their peripherals in the past, but this mouse is a little bit different. This is the Aivia Uranium with a ghost macro station and there are some things about it that are moderately interesting. 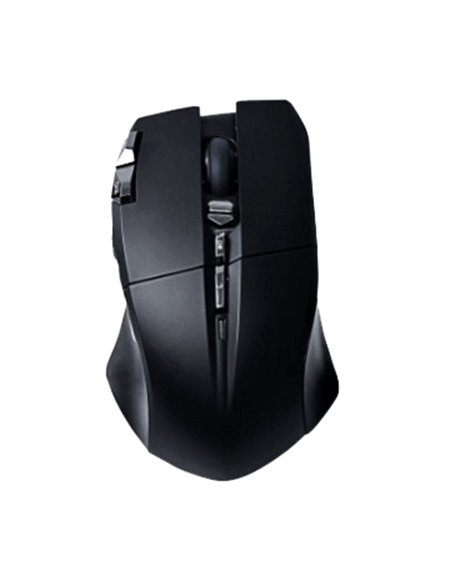 The mouse itself has a 6500 DPI twin eye gaming laser sensor that can handle a thousand points rate and that’s what you can do with USB 2.0. It can handle 50 hours of continuous battery life with its 2 AA batteries meaning you can easily swap them out in emergencies or whatever else the case may be, but you don’t even have to do that in an emergency because it’s got a lightweight cord that you can run to use it as a wired mouse while it charges, but to me, none of these things are really groundbreaking. To me, the groundbreaking thing is ghost macro station it comes with. It has a full on OLED display that you can use to navigate the onboard menus and make tons of changes to the mouse itself without even firing up the software, but first, I will like to give a little visual tour of the Gigabyte Aivia Uranium gaming mouse itself. At the front of the Gigabyte Aivia Uranium, there’s the charging port that plugs into the nice lightweight cable it comes with, but on the right side, you’ll not find a whole lot of anything other than a slightly textured but still a little bit more slippery plastic finish that I would have liked more. On the left side, there are four (4) G buttons, 2 of which are bound to forward and back by default and 2 of which are completely unbound, but you can bind to any combination. On the bottom, there are four slippery pads as well as the 6500 DPI laser sensor. There’s also a connect button which you probably won’t even need to use unless something disastrous happens and an on/off switch plus the two nickel metal hard dry rechargeable batteries that are included with the gaming mouse. A very nice touch! On the top, we find the scroll wheel that also supports tilt functionality, something I’m not a huge fan of because my lazy mouse posture causes me to hit it all the time but lots of people really like it. There is also a walker switch that you can use for on-the-fly DPI adjustments or whatever you want. It also has a wheel controller lock that you can use to change the wheel from being the gaming mouse wheel to being a navigation for the ghost macro station and finally, a profile switching button. What I have to say about the ergonomics are a couple of things; on the side and the ones to the left of my index finger, they are all surprisingly easy to reach. I particularly like the layout of G4 because it’s a very large button that you can either press it with the tip of your thumb or just roll on to it with the base of your thumb, meaning pretty much anybody should be able to access it. However, the buttons under the palm do continue to baffle me. Somehow, they make sense because it’s just a profile switcher and a navigation lock, but presumably, you are not gaming while you’re configuring your mouse of whatever else, so it’s better than usual, but I still don’t particularly like them. 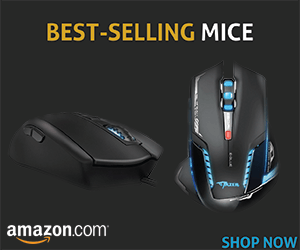 On the right hand side, the thing that bothered me was that the mouse is just too heavy to claw grip and then, unfortunately, even with my small hands, my pinky hangs off the side of the mouse if I try to palm it. So I really just had a hard time holding the mouse in a way that was comfortable and it’s unfortunate that it has that particular drawback because there are some other things in it that are really cool, many of which pertain to the ghost macro station itself. So moving on to the ghost macro station, it has an extremely bright, easy to read OLED display that can have a ghost logo on it or your own creation, whether it’s a bitmap or even hand drawn with the mouse itself, something that I spent time doing. It has on-board memory for macros Gigabyte cleanse and it’s a technology for flawless performance. It’s got a live editing mode which is cool because no software is required. All you have to do is press the wheel lock button and then you can use the mouse wheel as a D-Pad to navigate forward, back, up, and down to the menus and you can click to confirm your changes. You can do all kinds of stuff like change DPI values, you can edit profiles, switch profiles (even though you can do it with the mouse), assign basic remap functionality, and change key mapping functionality. Software is available and includes more functionalities such as a more granular DPI control and a pretty robust macro editor as well as the aforementioned drawing utility for the screen saver. That being said you don’t have to use the software to have a really good control of the Gigabyte Aivia Uranium gaming mouse.